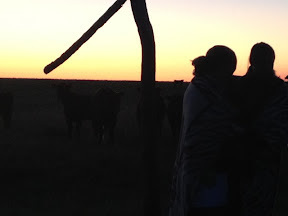 Kids, Cows and Grass: Easter sunrise service--with cows! You just never know...there might have been cows at Jesus' resurrection! 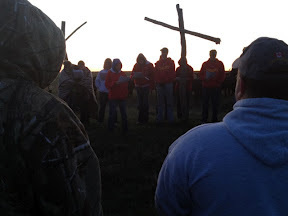 The local youth group has hosted Easter sunrise service at our pasture for many years. 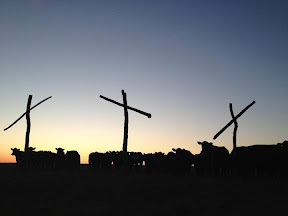 We have 3 crosses permanently installed on top of a hill in our pasture. The kids run the service and we gather close to watch the sun rise and sing "up from the grave He arose." 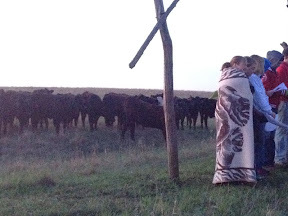 This year as the kids huddled in blankets and read the scripture, the yearling calves came to hear! The crowd faced the sunrise and the kids stood before the crosses facing us. 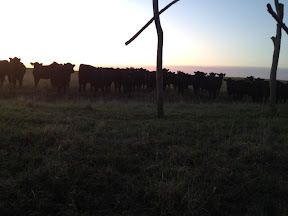 As they spoke, the cattle edged nearer and nearer, finally nearly touching the kids in their curiosity. I like to think they wanted to hear the good news of Jesus' resurrection, but they probably just wanted to know what all those people were doing in their space--and did they bring food? !